The Functional Film Blog sat down with members of DUNMORE’s product development and technical team. We asked questions related to the past, present, and future of film technology and how film materials have played a disruptive role. The following interview is with DUNMORE’s VP of Technology. What trends in film technology and chemistries excites you about working on new projects? From a new film technology perspective, advances being made in fluorinated films are exciting. Improvements are being made in the polymers and processing of these films, which gives you better clarity and other physical properties. These new characteristics are particularly important for greater utilization of materials such as ETFE films for the building and architectural market. On the chemistry side, there is so much going on. I am seeing new trends in functional materials that are reactive with the environment or some outside stimulus. An example would be new smart coatings that can react and absorb CO2, and would give you an indication that the CO2 level is too high. There are also self cleaning materials out there now where the combination of sunlight and rain will clean you windows or other surfaces. There is a lot of opportunity for this type of functionality, which is based on nanoparticle materials. Smart coatings can be used not only in building applications or interior applications, but also in medical applications. Smart coatings in conjunction with wearable sensors that can be connected wirelessly to the internet, can be given to a doctor for monitoring. If you have an event, you will be immediately sent to a hospital or a physician. The technology could also be used to automatically monitor blood sugar levels or other specific health monitoring applications. The possibilities with new coatings and films in these areas are limitless. Advancements in plastics, metals, and glass have evolved significantly over the past 25 years. Where do you see film materials being used more frequently in the future? There is a lot of development and technology evaluation going on in the electronics market. More specifically, you are seeing resources going into printed electronic materials used for wearable electronics, IoT devices, medical sensors and more. In the future I think there is going to be an increase in different types of plastic films used as base substrates for printed electronic materials. In addition to being light weight, plastic films will help reduce manufacturing costs and will open up design possibilities that will allow you to incorporate electronics into things that are currently not possible. In order for this to occur, adhesion promoting primer coatings enable manufacturers to produce laminates made of different substrates. New primers and print treated films support the development of stretchable, wearable, printed electronic technologies. In addition, films that can conform with the fabric that you are applying the electronics need to be stretchable and washable. We are also seeing more applications for plastic films used in the building / construction and architectural markets. Films will be used to replace glass, shade applications, and for energy reduction. The use of film for architectural applications is already taking place in Europe. You are just starting to see a greater adoption of architectural films in the United States. Films such as ETFE incorporate coatings that are IR reflective and also reduces the UV radiation inside buildings. These materials help protect the inside of buildings and reduces fading of interior materials. Don’t want to miss any of this this awesome content? Sign up for email notifications. Advancements in plastics, metals, and glass have evolved significantly over the past 25 years. Can you think of an example where plastic film disrupted a market? If we go way back, we can certainly look at some key examples. First, we can look at how music was recorded and listened to. Vinyl records were the incumbent technology for many years. Everything was on vinyl, and all the music was pressed on vinyl. Then, a new plastic film technology became available, which played a key role in the creation of 8 tracks and cassette tapes. That was a case where plastic films took market share away from the incumbent technology. Things have continued to evolve along this path ever since. Another example would be the use of metalized films as a replacement for foils in many applications, particularly in packaging. 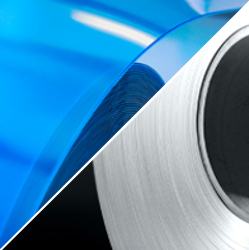 While you cannot get the same barrier with metalized film, it is still more than sufficient for most applications. You can metalize film or laminate metallized films on top of other materials to replace foil. Another way to look at how foils have changed over time is to consider that thicker foils, such as a plate, were originally used in the label industry for asset tags. The metal tags went onto original equipment as a metal stamp. Over the years they have been replaced with plastic films, metalized films that have a brushed effect, or matte films that have been metallized. It provides you the same look as the original metal stamp plate but at a much lower cost. In addition, the use of film labels made printing easier and improved the efficiency of the attachment process. If we look even further back, in the 1800’s Christmas tinsel was originally made of silver. Of course, this was very expensive and the silver tarnished. Lead was initially used as a replacement because it did not tarnish, but lead, of course, was eventually eliminated over lead poison concerns. The use of metallized films was a much better alternative, which is why it is so popular today. In addition to being safer, it looks better, offers a greater variety of colors, costs less money, and is easier to process. 5. Would You Like Paper or Plastic? Paper bags are another example of a product that was disrupted by plastic films. The plastic bag market has almost completely overtaken paper bags used in supermarkets. It has helped reduce cost and reduced the amount of space needed for storage of bags. There is some discussion on whether this is good from an environmental perspective, but no matter how you look at it, plastic bags are far more ubiquitous than any other type of bag. More recently, the backsheets on photovoltaic modules disrupted the solar market. Glass was the incumbent material, which has since been replaced with plastic films. Specifically, the backsheet material is made up of laminates of different types of film and foils. It reduces the overall weight, helps reduce the cost, and makes the final installation process much easier. In some PV module designs, glass is being replaced with fluorinated films on the top surface. What’s the newest technology for today’s automobiles? Ironically, it involves a process that goes back more than 2,000 years! But before we go way back to the 4th Century, let’s first go back to the 19th Century. The first modern automobile was invented in 1885, and to say the technology was primitive is being kind. These vehicles didn’t include brakes or turn signals – never mind air bags, seat belts, air-conditioning, or a stereo. In fact, it did not even have four wheels, just three; one in the front and two in the back. The four-wheeled car, which would became the prototype for what we now consider the standard automobile, was introduced a year later. However, if you think about it, the cars of today include some of the most revolutionary innovations in history. Rear-view cameras; satellite stereos; engines run by computer operating systems; Bluetooth capabilities for all forms of technologies. What was once a utilitarian mode of transit is now a mobile office and entertainment center for many Americans. Many wonder what the cars of the future will offer. While concepts like self-driving vehicles and alternative fuels may come to mind, some of the most exciting changes involve nanocoatings. But before we go into what nanocoatings are, let’s talk about its boundless capacities. Fully self-repairing paint, switchable colors, energy-harvesting bodywork, and shape-shifting exteriors. All of these innovations are being discussed as happening this century. All of these incredible concepts – and more not even fathomed yet – will come from nanocoatings. In addition, nanocoatings will lead to ultra-thin, anti-glare layers for windows and mirrors; lighter and stronger materials for better fuel consumption and increased safety; and smaller, more power-efficient electronic systems. And in one of the most intriguing concepts, nanocoatings have the potential to create smart material for vehicle self-repair. In today’s everyday use, nanocoatings have glass and glazed ceramic applications. Some examples of nanocoatings in your life are in showers, mirrors, sinks, as well as window and construction glass for conservatories and high-rise buildings. This technology is also part of today’s vehicles. Nanocoatings are used in automotive glass for front and side windows. A good example of this use is self-cleaning windshields, which eliminates the need for washer fluid. There are also anti-fingerprint coatings for interior and exterior mirrors. In addition, nanocoatings are designed for people who want the outside of their car to look as good as new. They provide protection against UV rays, heat, and wear. This helps maintain the color of the vehicle, as well as protect it from sun damage. So, as amazing as nanocoatings are already, the technology is just getting revved up! Be on the lookout for many more innovations and, if you get a chance, just consider how amazing these concepts truly are. The Functional Film Blog sat down with members of DUNMORE’s product development and technical team. We asked questions related to the past, present, and future of film technology and how film materials have played a disruptive role. The following interview is with DUNMORE’s lead research scientist. Where do you see film materials being used more frequently in the future? There are many areas that will adapt film materials to reduce weight. You see films being used more and more for housing and construction. They have been used before, but it is increasing more and more. Glass and metal tend to be heavy, so if you can get similar durability by substituting fully or part of the structure with plastic, that definitely offers an advantage. In the automobile industry there is a trend toward using lighter weight composites. Films are used as the skin material or the support material in composite structures. The demand to get better mileage out of a vehicle means automobile manufactures will have to reduce their weight and increase the use of composites. What trends in film technology/chemistries excites you about working on new projects? Printed electronics springs to my mind. The technology is still in the infancy stage, but I could see where other technologies and new applications utilize printed electronics in the next few years. There is also a new material that was invented relatively recently; Graphene, which is another form of carbon would have an application in printed electronics. Are there applications for film technology not being used today that could benefit from film materials? Edible films have been discussed before, materials like starch or gelatin and even fruits and vegetables can be made into a film. Edible films applied as the outer wrapping or primary packaging for food items could reduce both industrial and food waste. Moreover, these films can be used during food preparation to enhance flavor. Advancements in plastics, metals, and glass have significantly evolved over the past 25 years. Can you think of an example where a plastic film substrate disrupted a market and incumbent material? A good example is the multi film and foil laminate to replace metal cans. The US military was the first one to adopt that technology back in the 1950’s, with the military’s Meal, Ready-to-Eat (MRE) packages. The new packaging material reduced the weight that the soldiers had to carry, and eliminated the can taste to the food. The packaging was more technically advanced than your regular chip packaging with the combination of different films and foil to give the required properties. You have a 4 ply or 3 ply laminate combination of polyester, nylon, aluminum foil, and polypropylene. The polyester gives durability, and the nylon or polyamide gives puncture resistance. The aluminum foil is an effective barrier against oxygen, moisture, and microbes. Also, the polypropylene film is heat sealable and makes it inert to aggressive food materials. That was a specific application for the military, but later on, particularly in Asian countries like China and Japan, it has been the primary way to preserve food instead of using metal cans. What kind of impact did the film technology have on a different market application? Identical chemistry or structure for packaging is used to make lithium ion batteries. Previously, metal was used for regular batteries. By switching over to a plastic foil laminate you can pack in more energy, per unit volume than you can with metal. The chemistry is similar and all of the materials are pretty stable especially the inner layer of the polypropylene, which is quite inert to the very aggressive lithium ion chemistry. As a result, the weight and dimensions of lithium ion batteries have been reduced. It has revolutionized the development and evolution of your electronic devices, such as phones and laptops. Safety. Comfort. Speed. When you go on a plane, you expect the incorporation of all three elements during your flight. However, the only way this happens is from specialized films that protect the plane, make them lighter and more aerodynamic, and provide you with the entertainment that makes your travel time more enjoyable. However, what makes this all the more impressive is that you’ve probably never noticed the crucial role films play in air travel. Let’s start with the outside of the plane, and this is where film plays a key role in ensuring your safety. During a flight, lightning strikes can pose serious safety issues to the occupants of the plane. This can cause numerous life-safety issues, such as a spark near the fuel tank or for lightning to disrupt the complex electrical systems. When airplanes were predominantly made of aluminum, this was not an issue, because aluminum acts like a conductive shield, which causes electricity to harmlessly enter and exit the exterior of the plane. Today’s airplanes are made of more lightweight composite materials to decrease the plane’s overall weight and improve fuel efficiency. The trade-off is new planes no longer have built-in conductive shielding. To solve this engineering problem, the exterior composite parts are integrated with a unique surfacing film. This film, which is on the outer skin of the plane, has a fine foil or lightweight metal mesh embedded into it, which acts as a conductive shield. This is an example of how film technology solved an engineering problem and helped develop a safer and lighter plane. There are two areas within the interior of the plane where film plays a prominent role. Like the exterior of the plane, the interior walls are made of a composite, laminate system. This film is lightweight and incredibly durable, since it needs to hold up to heavy use on a daily basis. Another area of the interior of the plane that utilizes film, but is often overlooked by passengers, is the touch-screen display on the back of every headrest. Often times, the touch-screen display is constructed of both film and glass materials. Looking at the future of film technology in air travel, new airplane concepts will integrate display technology within the interior walls of the plane. The display screens, which require flexible film technology, will stretch out along the entire fuselage. The touch screen technology needed for future airplane designs will also utilize film as a protective, encapsulation layer, along with a functional polymeric film substrate that will act as the conductive layer of the touch-screen wall. The future design of airplanes and the flight experience will look dramatically different within the next decade, and film technology will play an important role in that revolution. Safety. Comfort. Speed. You can thank film for your enhanced flight experience. Our society has developed a taste for the local, and it’s led to a paradigm shift within the packaging industry. Normally, the packaging industry works within a vertically integrated system. This means companies often have the capacity to produce its own packaging in-house. On the surface, it doesn’t make sense to outsource this process. However, the “farm-to-table” movement has shaken up the industry in ways that are both exciting and innovative. If you shop at a farmer’s market, belong to a “community supported agriculture” organization, or are a member of a food co-op, you’ve seen these changes for a while. Only over the past few years has this movement made its way to supermarkets. Consumers are moving away from industrial processed food in favor of organic, locally raised, and locally harvested foods. The benefits of mass production and economies of scale are less desirable when you need packaging that “gets” the market. Every micro-market requires that its packaging reflect the region’s demographics as well as its staple foods. That’s why contract packaging manufacturers are now sought out by the larger food companies. They are more nimble and able manufacturer multiple smaller runs of custom packaging films tailor-made for each market. Moreover, the quantity of packaging is not the only issue. The desires of the new customer requires these packages reflect their belief system. Those that shop local typically want packaging that is minimal, sustainable, and more portable. The production of the packaging must have less of an impact on the environment. That means less packaging for the product, more sustainable raw materials used in the process, and less waste throughout the production and transportation processes. Packaging engineers are constantly looking for materials that are better for the environment – it makes the product more appealing. Moreover, creating flexible and “lay-flat” packaging also reduces environmental saves money now; more packages can be shipped using less fuel. Beyond the financial benefits, which are substantial, this process also reduces the amount of carbon emitted. Holistic approaches advocated for by the farm-to-table movement have integrated amongst most facets of the food industry. You will continue to see this influence within the packaging industry in ways that provide benefits – financially, environmentally, and healthwise – to our entire population. DUNMORE Corporation is recognized in the 2016 edition of NASA’s Spinoff magazine for its ability to develop products that protect and allow spacecraft and satellites to operate in the rigorous environment of space. DUNMORE, a leading supplier of coated, laminated, and metalized films for more than 40 years, has served the aerospace industry since 1985, supporting scores of National Aeronautics and Space Administration (NASA) space missions as well those of the European Space Agency and others around the world. The NASA Spinoff publication explores technologies originally developed for space missions, and adapted for applications right here on earth. These technologies are expansive, from radial tires to baby formula, and in DUNMORE’s case, Spinoff technologies make up a large part of the company’s product offerings today. Aircraft materials and reflective insulation are product examples of the company’s collaboration with space exploration. These cooperative developments have fundamentally changed DUNMORE into an industry leader in handling specialty films, foils and fabrics for technical applications. It let us to new markets entirely such as Photovoltaic backsheets and the films & foils used in the manufacturing of batteries. Learn more about DUNMORE’s work with NASA and the aircraft applications in its Spinoff magazine article or read the full press release.